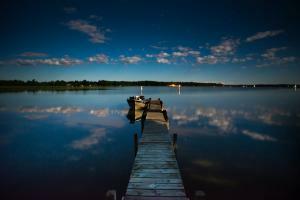 Shady Shores Resort on Moose Lake near Deer River Minnesota is the quintessence of the Northern Minnesota lake resort. Having been family owned since the land was first homesteaded, there's a depth of character that seems almost non-existent in the midst of our usually newly fabricated every day life. I took this shot after returning from a delightful campfire with the owners of the resort. Though I was very tired at the time, I could not have been more pleased to be awoken by the songs of the local loons carried through the screen windows of our cabin on the cool summer night's breeze.